Carrera™ Skin– a nylon/spandex blend that is lightweight, breathable, quick-drying and keeps its support and fit, even when wet. (I could barely even tell my shorts were damp after the swim). Low-rise – Not going to dig into your hips. One-piece seamless tri pad- No surprise seam that you’re going to find. Drawstring Elastic Waist with Wide Band –This is a great feature that keeps a possible muffin top at bay. All around fantastic short. Below is a shot of me in a recent race sporting the De Soto Carrera Low Rise’s and bringing home the medal. Coincidence? Other than the obvious aesthetics of tri shorts, it all ends up coming down to how comfortable we are. Females in particular tend to be far more concerned with this, and when talking about a tri short, the Women’s Carrera Tri Short tends to be the favorite. Maybe I’m a little bit partial to the short, seeing as how it’s the only short I wear for racing and training (even for the Ironman), but when it comes to the fit, it’s designed like no other short. Here is my short Carrera Tri Short Review. The primary feature of the short that separates itself is the wide-banded waist, which can either fit as low rise or right above the hip, depending on which model you choose. What makes this so important? The last thing you want with your triathlon short is for the waist band to be leaving awfully pretty indents in your stomach that dig into your waist. This isn’t an issue with the Carrera. The band is soft and wide enough to sit comfortably around your hips. The actual fabric of the short (Carrera™ Skin ) is made up of a nylon/spandex make-up which is breathable, moisture-wicking, and lightweight. There aren’t any surprise seams that you’ll find in the short 30 or 40 miles into your ride, either. The pad (although thin) is seamless, and makes for a comfortable run when off the bike. The shorts come in various shades and lengths (inseams varying from about 5” to 8”). The Carrera is feminine, comfortable, and affordable…and to reiterate, my personal favorite. 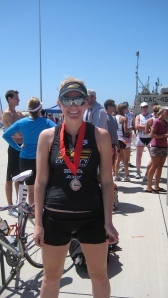 About author (added by editor): WorldofTri3 is a woman triathlete who has competed in distances up to Ironman. This is her review of the De Soto Carrera Tri Short. If you have questions or comments please leave them below. For the sake of being relevant here is a little blurb on what our website is about. Our focus is to write about current triathlon gear. Triathlon equipment, tri gear, or just tri stuff what ever you want to call it we'll write about it. Check out the tag cloud for popular categories like triathlon wetsuits, tri shorts, etc... If you don't see what you're looking for please feel free to drop us a comment and we'll do out best to write about it. We'd love to hear from you. Let us know how were doing. Leave comments if you like what we are doing and offer suggestions for triathlon gear you'd like to see. We'll do our best to write about the topics you are interested in.